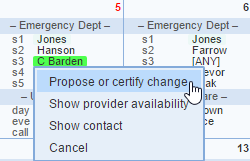 This option lets you propose a schedule change. You have the option to choose from 'Propose a schedule change' or 'Certify a schedule change'. The schedule will be changed once; the other involved provider accepts the schedule change within the 'My Proposals' screen. (If required by your schedule administrator, final administrative approval may be needed before the actual schedule is changed.) To email your proposal to all or limited individuals: your email proposal is automatically generated, and cannot be edited. If you wish to add any comments about the Certify schedule change or proposal, please enter them in the 'Comment' area. Select the shift you would like to 'give,' 'take', 'trade' or 'split'. Propose a schedule change: If you have not discussed the change with the other providers involved, or if you want to list the shift in the 'Swap Meet'. Certify a schedule change: If the change is already agreed upon by all parties that are involved. Email notifications will be sent to all of the parties who are involved in the schedule change. You may still require administrator approval before the change takes effect.